Today the #SundaySupper taste-makers are celebrating the arrival of spring. 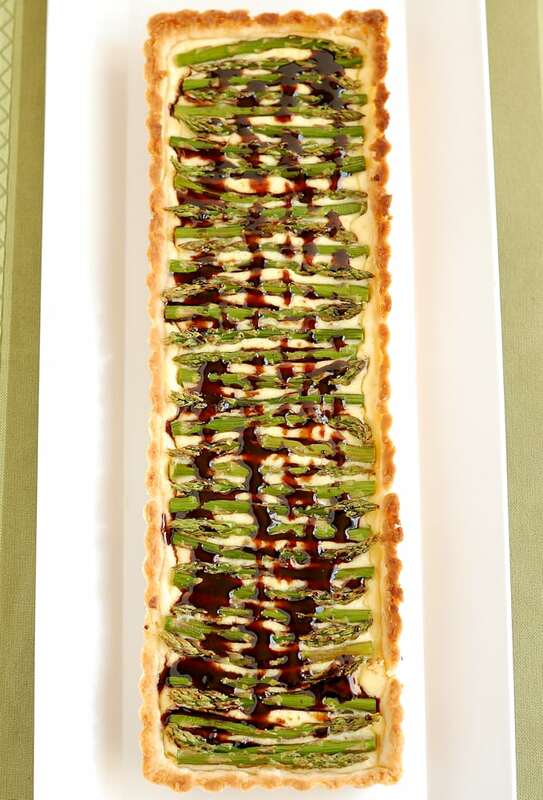 I made this Asparagus & Goat Cheese Tart because, to me, nothing says “spring” like beautiful fresh asparagus. 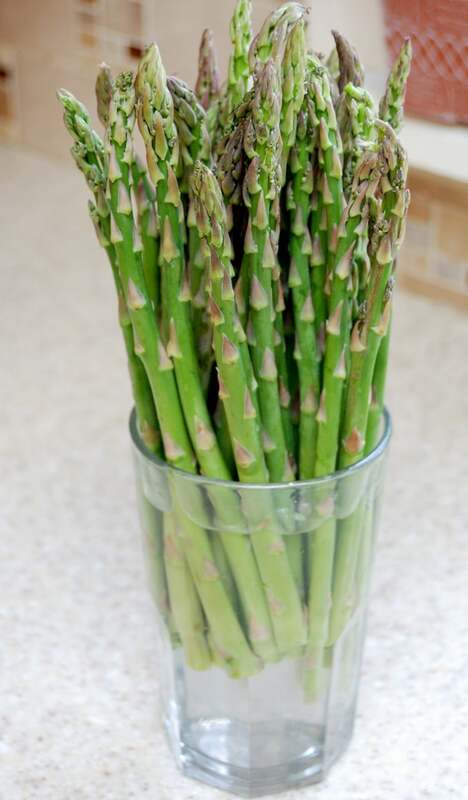 The best way to store asparagus is to trim the bottoms off of the stems then place them in a glass of water, just like you’d do with a bouquet of flowers. Place the glass in the refrigerator if you have room. Since I was using mine within a day I just kept them on the kitchen counter. 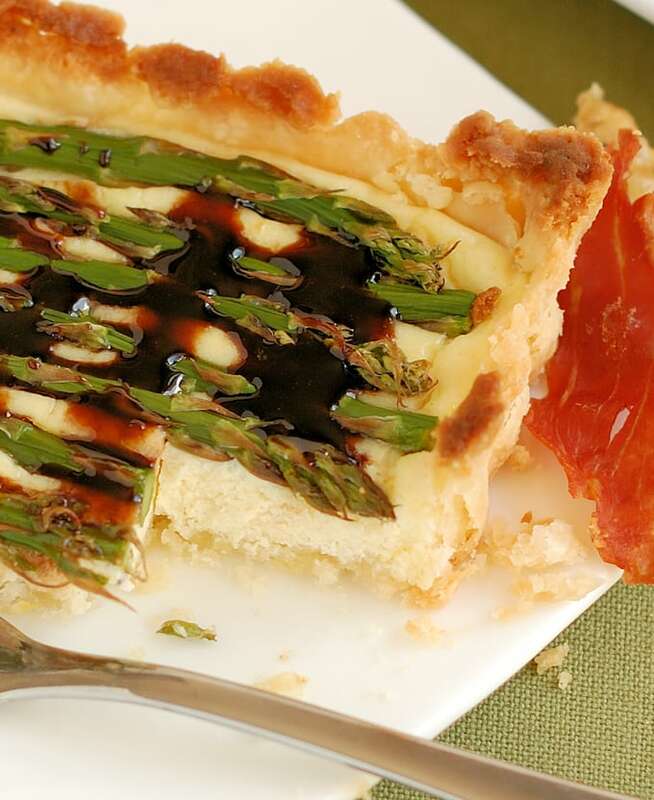 This tart is super easy to make and looks very elegant on the table. The whole thing comes together quickly and bakes in a matter of minutes. The base of the tart is a buttery, flaky pie crust. 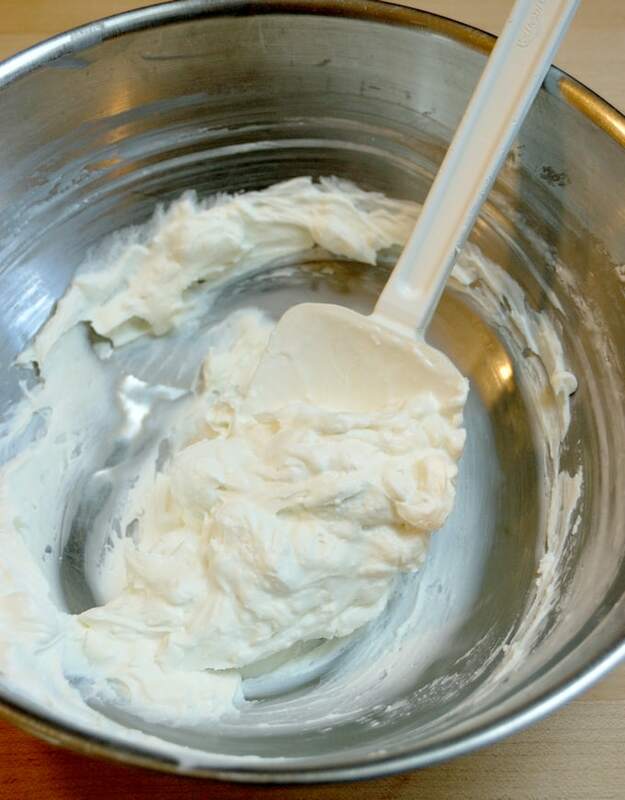 My recipe for pie crust is easy to make and very easy to handle. If you have a favorite recipe of course you can use that, or use a store-bought crust if that’s your preference. I baked this tart in a beautiful rectangular tart pan. I like the way the asparagus tips look all lined up in the pan. I laid the spears out with the tips alternating to either side to fit as many in the pan as possible. I used the bottoms of the spears to make Asparagus Soup. Waste not, want not! Try to get thin and tender spears for this dish so they can cook through while the tart bakes. If the spears you use are very thick you might want to briefly steam them to get them partially cooked before putting them on the tart. The balsamic glaze adds a sweet richness at the end and works well with the earthy goat cheese filling. 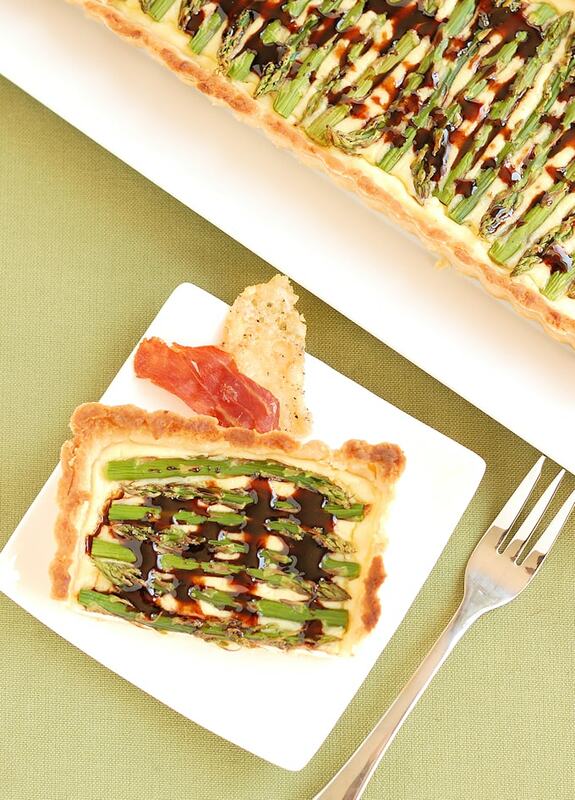 This Asparagus & Goat Cheese Tart would be the perfect starter for a springtime dinner party. It could also be served as a light lunch, or for brunch with a couple of poached eggs on the side and maybe a few prosciutto crisps. Serve it warm or at room temperature. Remove the tart shell from the oven and reduce the temperature by 25°F. Add the salt, pepper, nutmeg and lemon zest. Drizzle the glaze over the tart. The tart is best the day it's made, but leftovers can be refrigerated for several days. Thanks to Renee Pajestka from Renee’s Kitchen Adventures for hosting this week’s #SundaySupper. Check out these other delicious springtime dishes from the Sunday Supper taste-makers. Okay, I’m sold. This is completely delicious looking. Gorgeous photos. It looks just perfect. YES! Thanks, Kimberlie. The baking definitely comes easier than the photography does, for me. This is just AMAZING! I want this on my table now. I need to make this while the asparagus is in season! Thanks, Renee. I hope you like it. Oh man, this tart is stunning! Thanks! I’m sure you’ll do my recipe quite proud if you make it. Oh my goodness. This tart is beautiful. Would certainly take center stage on any table. Love that you included a blink to that tart pan. Love asparagus…it makes me think of spring too. I am going to bake this for Mother’s day I think. Thanks for the great recipe. Thanks, Lisa. I just love the way the spears line up in the rectangular pan. I hope your enjoy the tart if you make it. This is a perfect combination of flavors- I love goat cheese and the tang of the balsamic- the tart is beautiful- i love that pan! 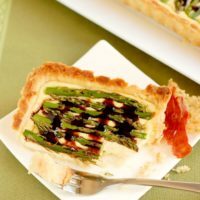 Two of my favorite things, asparagus and goat cheese! What a wonderful recipe. This looks wonderful! Such a great combo of flavors! I would have to say asparagus is my favorite spring veggies and I love the way you used it! The crust is flaky perfection! I bet that balsamic drizzle is fabulous. I’d sub the asparagus with beans and eat the whole pan! Looks delicious. Mmm, beans would be good too. 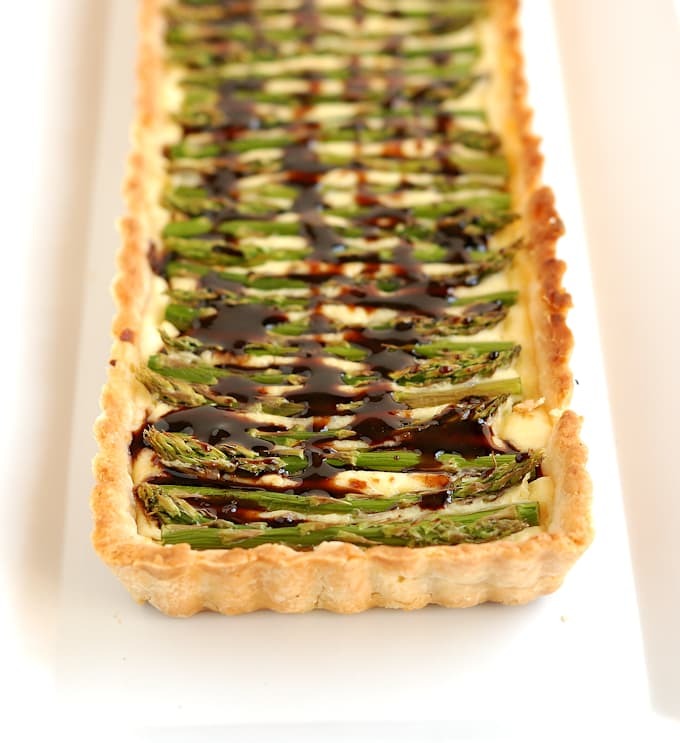 I love asparagus so any excuse and such a lovely looking tart is this is definitely a good one! Asparagus is SO good when it’s in season. 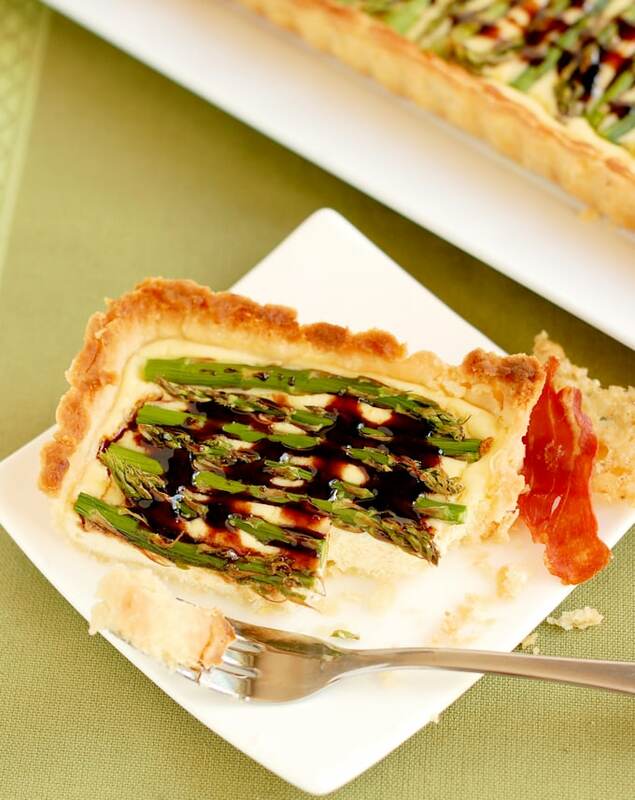 And your tart is just gorgeous—goat cheese and asparagus are a perfect combo! This looks absolutely divine! 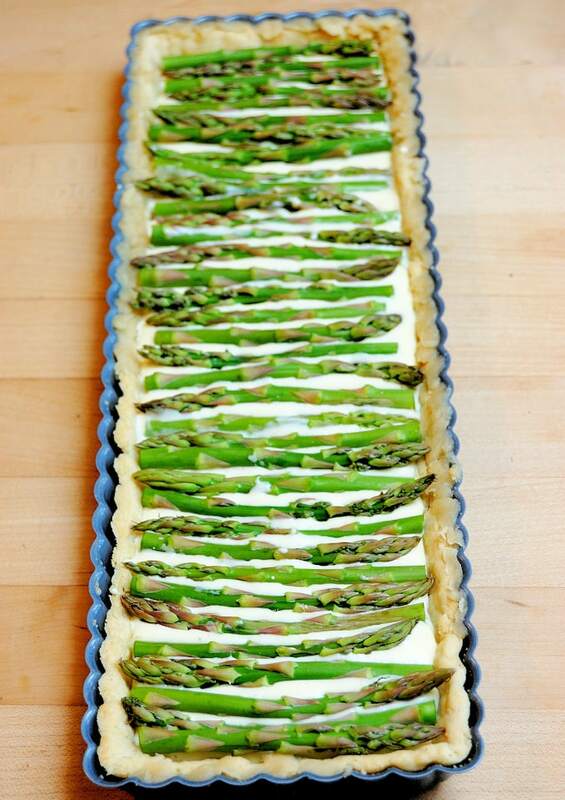 I love asparagus and goat’s cheese, it’s the perfect combination, and these photos are stunning Eileen! That tart looks like it could pop off the page and onto my plate!